As it stands right now, the machine I would most like to develop is a pedal powered refrigerator and possibly freezer. The compressor and drive mechanism will consist of a metal framework supporting a heavy flywheel perhaps 40 centimeters across and 25 kilograms. This is mounted in the center of the frame and is driven like the drive wheel on a bicycle by a set of gears and pedals mounted to the framework. A human operator sits in a seat on top and pedals away. The flywheel will be able to freewheel and will serve as an energy storage between the operator and the open drive compressor which is chain driven by a set ratio and mounted in the same plane as the flywheel. In order to provide the refrigeration needs for any 24 hour period, a human operator should not be expected to to pedal for more than an hour; less if possible. To provide the refrigerating effect, a thermal mass can be employed. Water ice is an obvious choice because of it’s high enthalpy of fusion and phase change temperature near the desired refrigerator cabinet temperature. To avoid the well known problems of water ice insulating effect around a direct expansion evaporator coil, I think it’s better to cool a water brine tank with phase change material vessels (water bottles) immersed in it. The evaporator could passively cool the water brine/PCM or if active brine circulation is advantageous then mechanical energy from the operator could be used. An efficient use of that energy might be a standing wave held in the tank with some sort of mechanical governor to guide it. It should be noted that my initial interest is to evaluate how much ice a human being can produce in a reasonable amount of time. I have not given great thought recently to the design of a refrigerator cabinet itself and how the phase change material should be utilized. Some cabinet materials being considered are: stainless steel, copper, plastic, glass, wood and cork insulation. Cork was at one time used extensively for refrigeration before being replaced by petroleum alternatives. Areas I would like to explore are door(s) improvements, windows, multiple compartments, cooling by radiation rather than convection and what I call right now ‘wet cold’. If convective cooling were used then perhaps water ice could cool the air directly and so avoid the drying out effects that plague modern refrigerators. No doubt some old texts on ice box construction could be of use in this matter. Another way to remove heat from the cabinet to melt the PCM, would be the use of heat pipes with thermostatically controlled valves to regulate temperature. A complication I wish to avoid. For the evaporator, I’m abandoning the dry type in favor of a flooded evaporator with low side float. There are several advantages to this including good thermal contact between the wet refrigerant and evaporator wall, less chance of slugging liquid to the compressor (if the float is working correctly), and the float itself. A simple mechanical float maintains refrigerant level within the evaporator and may avoid the problematic ‘hunting’ found in thermal expansion valves or the complicated controls of an electronic expansion valve. Whatever pressure is maintained in the suction line will determine the evaporator temperature so long as the float valve adds a steady ‘trickle’ of makeup refrigerant thereby ensuring it is never starving. As I currently understand it, the evaporator can remove the maximum amount of heat given the constraints of delta T, surface area, heat capacities and so on. The regulating factor in the operating pressure will not be an expansion valve which is most common, but instead the speed of the compressor. Lower evaporator temperatures are acquired by an increase in compressor speed. This will increase the heat removal, but also the compression ration, thus lowering overall efficiency. This machine, like most other vapor compression systems, is best run at a low speed over the course of the day rather than cyclicly allowing for smaller delta Ts, higher suction pressure, lower discharge pressure and thus smaller compression ratios, higher system efficiency and coefficient of performance. Since the machine is made to run less than 1/24 of the day, the surface area of the evaporator must be maximized in order to keep the delta T to a minimum. As far as the condenser goes, the waste heat pumped from the phase change material representing the heat load removed from the refrigerator cabinet the previous day could be used for preheating the domestic hot water supply. It could also be emitted into the local environment if heating were needed. It should be noted at this point that if the refrigerator were to be used in a climate where seasonal temperatures dipped below freezing for even just a few weeks out of the year, that a passive heat pipe radiator could be installed on the outside of the home capable of keeping the PCM frozen. If the condenser heat is to be radiated into the local environment, even a rather warm one, then the delta T may have to be impractically high in order to cool the whole day’s load. On the other hand, if the condenser heat could be stored while the machine is running only to be released throughout the day, then the discharge temperature and thus the high side pressure can be much lower assuming sufficient surface area. I am of course talking about another application for PCMs. In this case I am thinking of something with a fusion temperature 15 to 30 degrees Fahrenheit warmer than ambient. Eutectic salts and Paraffin Wax comes to mind. 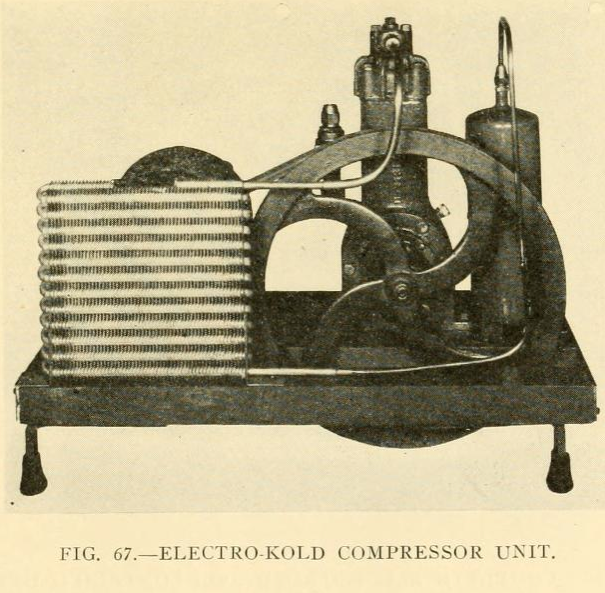 The driver of this contraption would have mechanical pressure gauge readouts with indicators of appropriate operating ranges to get the desired effect. The machine is entirely mechanical however, an electronic microcontroller could be used to monitor temperatures throughout the system and provide the operator with interesting and useful information about the re-freeze progress, system performance, log system history, cabinet use and habits as well as provide bio-feedback of the person’s heart rate and calories burned. The entire machine could of course be run off a small DC electric motor rather than pedal power, but there is much to be gained by rethinking the construction of a refrigerating machine by framing it around the physical limitations of the human body. It would be also interesting to experience the amount of work it takes for domestic refrigeration. With a DC motor this machine might adapt well to a solar power system or other off grid battery system with limited joules to spare. Better yet is it’s application to people who have no access to electricity or hydrocarbon fuels needed for absorption refrigerators. The last point goes hand in hand with making this an appropriate technology that is long lasting and reliable, built from accessible materials. The exception to this is at least the compressor and evaporator/float valve. To make this technology available to people, a detailed illustrative book could be made describing the theory, materials needed, construction and operation of the machine. A kit could be sold with the book and any of the hard to find components at or near wholesale value. Direct profit may only inhibit it’s adoption and an alternative means of benefit would need to be explored. This needs to be non-proprietary, un-patentable and owned by the people. I don’t even know if the thing would work, but I’m sure interested in finding out. All very valid points. Many of the features I talk about are things I would like in my own refrigerator and I suspect there are other people that would appreciate them as well. Many people? I don’t know. Like anything with a lot of thermal mass, it would require a great deal of effort to get it down to temperature initially and so would benefit from some other motive force. As a demonstrative piece, something with low mass and excellent insulation would be ideal. neat idea but wouldn’t it be a lot easier (for the user) to have say an absorption refrigerator run on a small wood or charcoal firebox? Maybe a rocket stove or some sort. Sticks and twigs can always be found. Time is money they say and an hour a day to keep food cold can add up, for me I am looking for a fridge thats off grid and 100% reliable. Mechanical, chemical and fueled by something i can come up with on hand at any time. Yes electric can be made via pv, wind or hydro but those things don’t always play nice. My area is low wind, the sun might not shine for weeks during the winter and i have no access to strong year round streams on the property. Wood though, i can find that everywhere. Natures abundant battery. Servel definitely proved the longevity of its refrigerators. Mine is over 70 years old and beyond some cosmetic issues (gaskets, rust etc) it work fine as it did the day it came off the line. Regulation would be impossible so it would pretty much be an icemaker. I don’t think a thermostat connected to a dampener would work fast enough to hold 38 degrees. No idea on the mixture. I know helium and ammonia have been used in the newer refrigerators. A lot of thermal mass may keep the fridge going for longer and more evenly. Just depends on the temp needed to boil the ammonia. Joshua, I couldn’t agree more. I wrote this post over five years ago, and I recognize the impracticality of a pedal powered fridge. The desire here was mainly to challenge myself to create something efficient enough to be human powered so it would force me to think outside the box and be able to run it on minimal mechanical power. I’m largely moving away from rotary mechanical vapor compression, and into heat powered refrigeration systems. This is to eliminate moving parts, and thus specialized components that I have to rely upon manufacturers to provide. I also appreciate the simplicity and potential reliability that comes from building something myself out of tubing and pipe. There are two main technologies I’m interested in: thermal ejector refrigeration, and ammonia absorption. I have a method in mind to eliminate the feed pump in an ejector system, but it will take some time. Absorption can be accomplished in two ways: continuous diffusion absorption, and intermittent absorption. These are all intended to be fired with wood, with the heat applied hydroponically. Solar thermal could be used to supplement the wood. I’ve been working on these concepts for some time now. Perhaps I should begin writing again and outline the various technologies I plan on experimenting with. I’m moving back to rural Pennsylvania, and I’d like to eliminate electricity from my lifestyle as much as possible. Many passive systems will be used to preserve food, but some thermally driven active refrigeration systems needs worked out too. If you’re interested in talking, shoot me an e-mail. I rarely get the opportunity to discuss these interests. It’s uncommon to find someone that isn’t cuckoo for everything PV. There’s a fair chance I’ll never own a PV system, and still find a way to stay off grid. That’s the goal. Sir, most interesting…hope you are still actively engaged. I share some of your perspectives, although I cannot be of much help in the area of refrigeration. – they were able to use wind towers to direct air flow into an underground area perhaps over water, and out through another tower to lower temps & to chill the building, reputedly even having ice cream during the hottest part of the year… but the part I find of note is that they did not use any mechanical devices to do it. Basically just re-directing the prevailing wind. No electric, no pumps, only the thermodynamics that already exist. In Kashan, Iran they also built down into the ground and had a central chimney, kind of a nuclear tower inside the home, which allowed a convection cell to circulate the air through vents along the perimeter of the floor. I do tinker and plumb and weld and build and have spent much of my time studying shelter and energy issues, and over the last decade on philosophy. I hope to network with innovative people who have a different vision of how we will deal with some of the things you speak about. Humanure is something else we may share an interest in. For me much about man’s behavior has to do with a lot of mis-information and inaccurate ideas about who we are as homo sapiens sapiens. Of course, you are an exception to that general mind-set and typical thinking which has allowed us to arrive where we are today. I recently got in touch via HS website with some of my HS classmates and realized that I was a little further from the center of the bell curve than I thought. so your comment about talking to people who may have similar interests reminded me that one has to seek out those who may have a broader outlook purely as a survival ploy. ( if one truly seeks to create a different outlook than the one we seem to have currently) That may not be on your agenda, but, as you have already demonstrated by your forays into pioneering other forms of refrigeration, one that cannot be too far from your heart. You have to think it before you can do it. How people will live has a lot to do with how they think about what life is about. Finding reasonable shelter, using less energy-intensive ways of doing a lot of things, and then seeking a certain amount of consensus in approaching some of these questions are all important.